The Portland company buying the 30 acres next to Bug Light Park says it hasn't decided how to develop it. 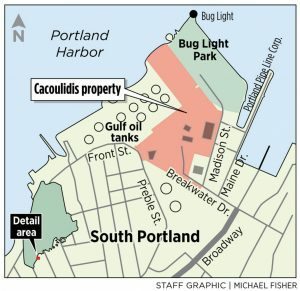 SOUTH PORTLAND — A Portland development company has purchased 30 acres of prime waterfront property that the Cacoulidis family has been trying to redevelop for two decades. L+R Northpoint, a holding company of PK Realty Management, purchased the former shipyard land where the late John Cacoulidis once proposed building a $900 million hotel and convention center that would have included a cable-car system across Portland Harbor. L+R Northpoint is headed by Richard Packard, a Maine native whose 30-year career in real estate includes residential and hotel development in Newport Beach, California. The family company has no firm plans for the property, which is located next to Bug Light Park and was part of a marine industrial complex where Liberty ships were built during World War II. “While we are still in the very early stages of considering possible best uses for the land, we believe there is exciting potential to develop something that will add to the vitality of our community for generations to come,” Packard said Monday. The sale closed Nov. 8. The Packards wouldn’t reveal the price. Cacoulidis, who died in July, bought the largest parcel, at 149 Front St., for $1.4 million in 1999, according to city tax records. It was the centerpiece of a 2001 proposal for a convention center that featured two 41-story, elliptical-shaped hotel towers with a total of 2,600 rooms. The proposal also called for a 300-foot-tall cable-car system that would have carried visitors across the harbor to Portland, as well as a marina for cruise ships and two hospitals, for general and plastic surgery. Public reaction ranged from disbelief to anger, with many saying the plan was too big and too urban. Cacoulidis scaled down the project in subsequent years, but it never got off the drawing board. Cacoulidis’ son, George Cacoulidis, CEO of the Cacoulidis Cos., said that it recently became clear that it was time to sell the property to the Packard family. 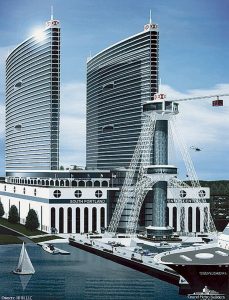 The largest parcel of the 30-acre waterfront property being sold was the centerpiece of a 2001 proposal for a convention center featuring two 41-story hotel towers with 2,600 rooms and a cable-car system to carry visitors across the harbor to Portland. The two companies were connected by their real estate representatives, Thom Moulton and Katie Millett of NAI The Dunham Group in Portland, as well as through their mutual use of Archetype Architects of Portland. Founded several years ago, PK Realty Management specializes in commercial, industrial and residential redevelopment of historic properties. Recent and ongoing projects include renovation of a commercial building at 17 Westfield St., in Portland’s Libbytown neighborhood, now home to the Bunker Brewing Co.; redevelopment of the former Deliverance Church at 1006 Congress St. for commercial and residential use; and renovation of a portion of the Lancaster Building at 50 Monument Square for residential use. The South Portland property stretches across a significant portion of Cushing’s Point, just beyond the Ferry Village neighborhood, from Front Street to Madison Street and to a boat launch on the Fore River. It’s in the shipyard zoning district, which allows a variety of light industrial, marine and commercial uses, including hotels, restaurants, offices and shops. It includes several industrial buildings, warehouses and large open spaces where nearby residents previously walked their dogs on the way to Bug Light Park. In 2016, the entire property was cleared of brush and fenced off when the Cacoulidis family renewed its effort to redevelop or sell the land. “That’s an old stomping ground for a lot of us, until they cleaned up the property a couple years ago, so we knew something like this was going to happen,” said Mayor-elect Claude Morgan, the city councilor who represents the waterfront district. Morgan noted that development of the property likely would be limited by the carrying capacity of Broadway, a two-lane artery that feeds the peninsula and is heavily used as the main route to Southern Maine Community College. Morgan said he would encourage the developers to reach out to the surrounding neighborhood for guidance on what might work best. He also suggested they maintain a connection to the city’s working waterfront, including the region’s growing aquaculture industry. That’s the plan, said Packard’s daughter, Jennifer Packard, a principal of PK Realty Management who is managing the Liberty Shipyard Project. Her business experience includes working as a consultant for BMW/MINI, Audi and AMG (Mercedes Benz) in Europe, America and South Korea. Her younger brother, David Packard, is managing legal matters for the project. Packard said her family wants to find out what the city and the neighborhood need and what concerns they might have. She said they plan to keep the existing industrial buildings on the property – features that attracted their investment because there’s growing demand for industrial space in Greater Portland. Much of the industrial space is leased, she said, which provides some income and gives them time to consider all options for the rest of the property. “It’s a beautiful spot and we have a lot of confidence in its potential, but it’s going to take a while to find what that is,” Packard said. 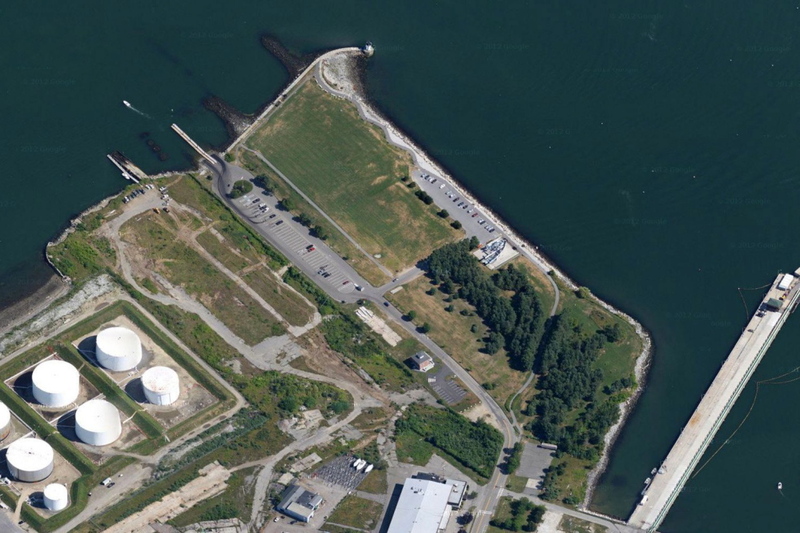 She called it “an interesting and challenging” property, including restrictions related to being near massive fuel storage tanks owned by the Portland Pipe Line Corp. and other companies. At this point, she said, all options are open, including housing, a hotel and a marina. Whatever happens on the property will be influenced by the family’s ties to the shipyard, she said. Her grandfather enlisted as a merchant marine and served on Liberty ships and her step-grandfather worked in the shipyard.